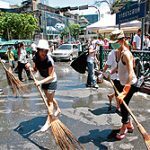 The front cover of this Monday’s Nation newspaper – an English-language publication in Thailand – showed a photo of Thais and foreigners rolling up their sleeves and digging in to help with the massive clean-up process required as a result of the events of the past few weeks. Armed with large plastic bags and rubber gloves, thousands of people who call this place “home” – whether for a week, a month, a year, or a lifetime – were out in droves to do their part in restoring the magnificent capitol to its normal state. Safe in Bangkok now – thank you for your concern! 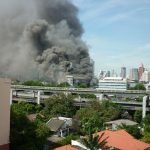 The situation in Bangkok on Wednesday, May 19 was like a scene right out of a nightmare. But, unlike a bad dream, the violence, fires, and bombs were very real and not only caused death and injury to many, but also displaced thousands of Bangkokians from their homes. CHICAGO – Author Brenda Bence’s book on how to find a job using personal branding – How YOU™ are like Shampoo for Job Seekers: The Proven Personal Branding System To Help You Succeed In Any Interview And Secure the Job of Your Dreams – is an award-winning finalist in the Career category of the FOREWORD REVIEWS’ 2009 BOOK OF THE YEAR AWARDS. The winners in each category, as well as Best Fiction and Best Nonfiction winners, will be announced at Book Expo America in New York City on May 26, 2010.